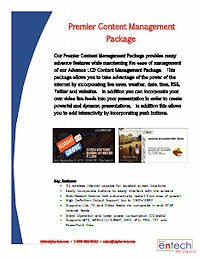 Our Premier Content Management Package provides many advance features while maintaining the ease of management of our Advance LCD Content Management Package. This package allows you to take advantage of the power of the internet by incorporating live news, weather, date, time, RSS, Twitter and websites. In addition you can incorporate your own video live feeds into your presentation in order to create powerful and dynamic presentations. In addition this allows you to add interactivity by incorporating push buttons.